This NASA graphic shows the orbit of asteroid 2014 HL129. Discoveryed on April 28, 2014, the asteroid passed close by Earth on May 3, coming within 186,000 miles of the planet. 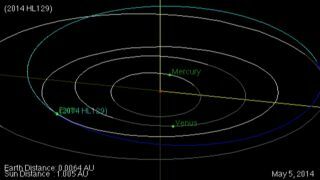 The newly discovered asteroid 2014 HL129 came within 186,000 miles (299,338 kilometers) of Earth when it made its closest approach on Saturday morning, which is close enough to pass between the planet and the orbit of the moon. The average distance between the Earth and moon is about 238,855 miles (384,400 km).